An easy salsa recipe can be a traditional tomato salsa recipe that has been fermented. This is the new and more exciting way to consume a salsa recipe. And a tomatillo salsa recipe can be a refreshing change from the more traditional tomato salsa recipe. A tomatillo salsa is a green salsa recipe that uses the tomatillo as the main ingredient instead of tomatoes. Just remember an easy salsa recipe will only require a few fresh key ingredients when you're making a traditional tomato salsa recipe or making a fermented tomato salsa recipe. This is my new and favorite way to eat salsa - the fermented way! And you'll get a bunch of probiotics along with your easy salsa recipe. The hard part of this recipe will be waiting to eat your salsa. The best part, is that a fermented salsa recipe will have a longer shelf life than fresh salsa. You can also make a lacto-fermented tomato salsa recipe using whey which cuts down on the amount of salt used to make a fermented salsa. Add ingredients to a bowl and massage salt into the ingredients. Then press ingredients into a glass jar to release juices and get rid of any air pockets. Fill glass jar until 1 inch from the top and add a weight of choice (clean rock, etc.) so that the ingredients stay covered with juices. Put on a lid and ferment for 3 days on your kitchen counter or on a room temperature shelf. You can then store your fermented salsa in the refrigerator for a few months. If you want a more traditional tomato salsa recipe, this is a very good one! This would also be a good recipe to turn into a fermented salsa recipe. Be sure to use a wooden spoon to mix your salsa ingredients together to get the best flavor from this pico de gallo recipe. Eat pico de gallo with your favorite tortilla chips. Even though this is a somewhat cooked green salsa recipe, I think this easy salsa recipe is outstanding. A tomatillo salsa recipe is a green salsa recipe that is very common in Mexico. This green salsa recipe uses the tomatillo fruit instead of tomatoes. Tomatillos have a very distinct tart flavor. 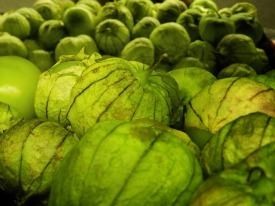 Tomatillos can be used raw or cooked in a tomatillo salsa recipe. A tomatillo is sometimes called a green Mexican tomato. It looks just like a small green tomato and comes with a paper-like husk which is inedible. Like the tomato, this fruit is also a member of the nightshade family. Tomatillos are related to tomatoes as well as the Cape Gooseberry. Usually, tomatillos are used in their green or unripe state which gives a green salsa recipe a tart citrus flavor However, when a tomatillo ripens it can be yellow to purple in color and will have a sweeter taste. Look for tomatillos that are surrounded by a light brown and fresh looking husk which indicates freshness. This is a different type of easy salsa recipe. Sweet peppers are added for a different depth of flavor and extra color which makes this easy salsa recipe more interesting. 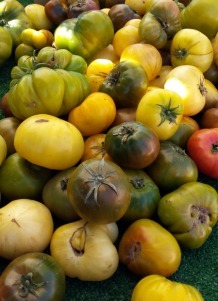 Also, a variety of heirloom tomatoes can be used like cherry tomatoes, yellow tomatoes, or orange tomatoes. 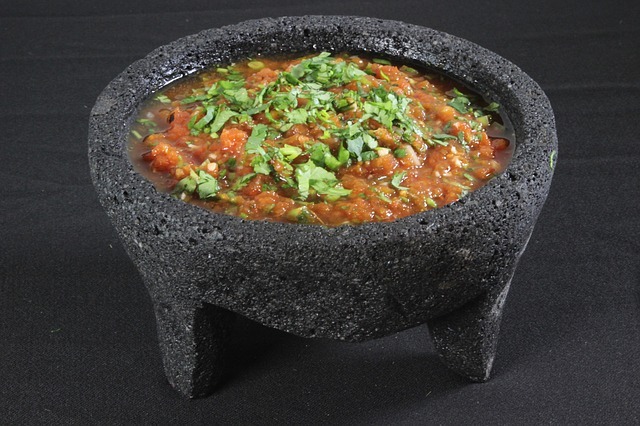 Use a small food processor to blend your salsa. Be sure to add the tomatoes in last and just pulse to make a chunky tomato salsa recipe. Heirloom tomatoes can be greenish to purple in color and should be used to increase the depth of flavor of your easy salsa recipes. Also, if you want a more rich tasting tomato salsa recipe use vine-ripened tomatoes. You'll find a great variety of tomatoes at higher end grocery stores and at farmer's markets. Please stay away from tomatoes that are hard and bland tasting!